Read a lot of ebooks? Amazon customers may soon have access to more than 600,000 titles for a monthly subscription fee, a deal that could be right up your alley. GigaOM reported that Amazon may be planning to become the Netflix of ebooks as revealed by mistakenly leaked product pages advertising a new subscription service called Kindle Unlimited. The pages in question were first spotted by publishers and readers on the Kindle Boards early Wednesday, although most of that evidence vanished from Amazon's website as quickly as it first appeared. Thankfully, Google has come to the rescue, allowing those cached pages to be called up from the great beyond for further scrutiny ahead of Amazon officially launching the all-you-can-eat ebook subscription service. One such screenshot touts "unlimited access to over 600,000 titles and thousands of audiobooks on any device for just $9.99 a month," which sounds a lot like what competing ebook subscription services Scribd and Oyster already offer. The price in straight conversions comes out to about £6 and AU$11. 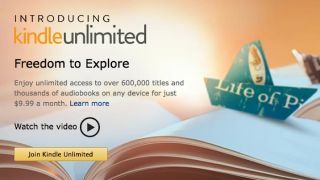 For the moment, available Kindle Unlimited content appears to be flush with titles already available through the Kindle Owners' Lending Library, which allows Amazon Prime subscribers who also own one of the company's tablets to "borrow" one ebook free each month. Conspicuously absent from the test pages, however, are major publishers like Simon & Schuster or HarperCollins, both of whom already offer titles to Amazon's subscription-based competitors. One web page entitled "KU Test," which is still live at the time of this writing, displays a total of 638,416 available ebook titles, plus another 7,351 Whispersync for Voice-enabled audiobooks, which could offer Amazon a competitive edge over rivals. Check out our review of Amazon's Fire TV while you're here!